I remember being scared of that Blanka. Haven’t seen or thought about it in decades. Now scared again. Growing up in Australia in the 80s/90s, I have a very weird emotional attachment to these old retailer catalogues, because in the days before the internet—or even reliable games mags—they were the only real way to get info on what games were coming out and, more importantly, when. I still think that Grand Prix cover is one of the all-time greats. Via Kotaku Australia, here’s a back catalogue (sorry) of catalogues that were sent out by The Gamesmen, a retailer that despite its mail order and physical heritage still lives on in 2017. If you have only ever grown up with the internet, then I am happy/sorry for you. But these catalogues were, in spite of their primitive nature, amazing for a kid at the time: it was like the less information and images available for the latest games, the more you cherished and obsessed over the ones you did have. Even if they were just box art. 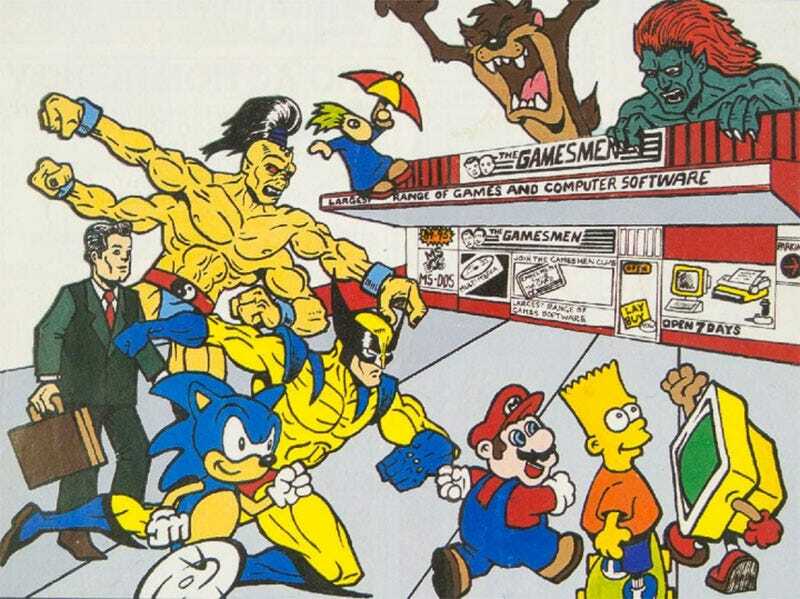 In addition to games and hardware and objective product reviews, Gamesmen also sold other stuff. Like t-shirts. And I dig how, in the early 90s, a retailer could be 100% down with circumventing Nintendo’s regional restrictions. Anyway, if you want to have a flick through these, you can check out the complete range here. They date from the 90s through to 2016, so yeah, there are GameCubes and Dreamcasts to go with the C64s and Mega Drives.